‘In the Shadow of the Sun King’ (a novel set in seventeenth century France) I found a fast-paced read that kept me riveted to the page. This debut novel by Golden Keyes Parsons starts off at a gallop when Madeleine Clavell’s children are sent running for their lives as the dragoons of King Louise XIV thunder onto their family estate. They must get their sons into hiding to protect them from being taken away and re-educated in beliefs that are not theirs. In the very first chapter the Clavell family is ripped apart; the boys to live in a cave with their uncle and an unknown future, and the small daughter of Madeleine and Francoise kept at the manor in the hope that she would be of little interest to the king’s soldiers. Madeleine quickly travels to Versailles in the hopes that King Louise still holds a tenderness for her, and praying she can convince him to give immunity to her family. She banks the safety of her loved ones on an old affair with the king, only to discover how wrong she is. As the story progresses, her family is further torn from her arms and sent in different directions. But what breach of law would motivate the king of France to tear this family asunder and others like them? It is the fact that the Clavell family are Huguenots and refuse to renounce their Protestant beliefs and officially become part of the state religion—Catholicism. It is a time of thought police, book burnings, and pillaging of homes and villages. A time of persecution. Ms. Parsons deals delicately with this difficult stage of church history. After reading this story I came away understanding this time, but with the sense that it had less to do with Christendom and everything to do with unscrupulous men of power who used the faith of their people against them. Not once did I get the impression from the author that Catholic people were to blame for the atrocities. Instead, both Catholics and Protestants had moments in the story to shine as heroes, while others (in both denominations) are seen to be wolves in sheep’s clothing. This story beautifully shows us that true faith is not something we belong to like a club, but that God has rejuvinated our hearts to do good works because of a faith-relationship with Jesus Christ. 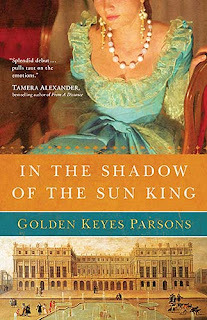 Golden Keyes Parsons knows this history well, pulling on her own ancestry. The pages are painted with detail, adding a richness to this vivid plot with its twists and turns, and making the court of King Louis come alive once again. The reader is also inspired with the bravery and faith of the characters. It made me wonder if I would be as strong and courageous in the face of such persecution. This first novel is the start of a series that this reader will be following. While this book may be your ‘debut’ it shows the long journey of a writer called by God. Your years of apprenticeship show in the exquisite crafting of this novel. An Interview of . . . me?